Indraprastha is yet another ancient city of the mythological times which is famous for its pomp and grandeur. The origins of Indraprastha are described in the epic Mahabharata in the ‘Khandav-dahan parva’, and the city is stated as the magnificent capital of the Pandavas and an important part of the Kuru kingdom. 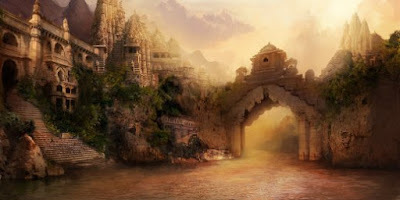 When the Pandavas returned to Hastinapur after marrying Draupadi, the elders of the Kuru family, Bheeshma, Dhritarashtra and Dronacharya offered to divide the kingdom into two and give one half of it to the Pandavas where they could set up their capital and rule, the other half including Hastinapur, to be ruled over by Kauravas. Duryodhana had to abide by the proposal, albeit grudgingly. The Pandava brothers accepted the proposal and went ahead to form their kingdom. The Pandava share of the kingdom included a large forest called Khandav-van on the banks of the Yamuna River. It was a dense dark forest inhabited by demons and nagas (snakes) who constantly indulged in ‘adharma’ (unjust) and illegal practices. They had made the Khandav-van an infamous place and though there were animals and birds galore in the forest, no one thought of the place with any positivity. While Krishna and Arjuna were searching for a suitable place to build their capital, Krishna suggested to Arjuna to burn down the Khandav-van and create their capital in that place. Accordingly, they sought the help of Agni who set fire to the expansive forest and devoured Khandav-van completely. A more grounded mythological tale says that while Khandav-van was burning in the raging fire and all its nether-world inhabitants were dying in it, two people emerged from the fire and begged Arjuna to spare their lives. One was the last living King of the Indra tribes, who had been banished from Hastinapur and was living in exile, while the other was the demon architect Mayasura. An alternate mythological version cites that the Indra tribe were the representatives of Lord Indra on earth and carried his god-like qualities. Also, the last Indra king had been chosen by Rishi Ved Vyas to impregnate queen Kunti during the birth of the Pandavas, as per the Niyog pratha followed at the time. The son born to Kunti from the last Indra king was Arjuna, who possessed similar divine qualities like Lord Indra. The reason for banishment of the last Indra King was due to the reason of the Niyog pratha: that he must not ever return to Hastinapur or appear in front of anyone from the Kuru royal family till he lived. Mayasura, on the other hand, was an Asura but from the line of the divinely skilled architects, who had once been the pupil of Vishwakarma himself. Mayasura’s ancestors who were expertly skilled in divine architecture were known to have built the ‘Swarna-Lanka’ (the golden city of Lanka) for Ravana in the Treta Yuga. But they had all been killed during the later wars waged against the Asuras, and Mayasura was the last of their line. As Agni burned down the entire Khandav-van and the ground cleared, Mayasura built Indraprastha at the site, one of the most magnificent cities ever seen till that time. Mayasura was so grateful to Arjuna for having saved his life, that he delivered his best creation ever in building an opulent and ornate capital city for the Pandavas. Folklore says that at the completion of Indraprastha, Lord Vishwakarma himself was so pleased with the work of his disciple that he blessed Mayasura saying that the dazzling city he has created will live forever. As the Indra king congratulated him on his new city, Arjuna said that he would like to name the city Indraprastha after his Indra father, as it was the place where the Indra king had been banished and had stayed in exile hiding in the Khandav-van, and it was also his way of paying tribute to the Indra tribe. The old man was very touched with the gesture of Arjuna and blessed him wholeheartedly. Apart from the story of its origins in the Mahabharata era, Indraprastha features for few more important events and references in the epic. The inauguration of Indraprastha was a grandiloquent affair and all the invited kings and guests remained awestruck and surprised with its magnificence. They showered praises and eloquent epithets describing the city and its grandeur which no one had hitherto seen, even the pomp of Hastinapur seemed to pale against it. It was in the backdrop of this extravagant Pandava capital that two quiet incidents occurred. Mayasura had built a special palace in Indraprastha called the Mayasabha (the gallery of illusions). It was exquisite yet illusory to the eye, and it was one such illusion at the Mayasabha that Duryodhana mistook a water-pool to be a marble platform and accidentally fell into, much to his embarrassment as many including the ladies of the house laughed on his faux paus. The enraged Duryodhana stormed out of Indraprastha after this incident burning in humiliation, vowing to punish the Pandavas for it in retribution. The other incident, as mentioned in some alternate versions of mythology, occurred on the morning of the inauguration. At the centre of Indraprastha, Mayasura had built a large Shiva temple where the first pujas would be conducted as soon as the royal procession reached the temple. However, as the royal procession carrying Yudhisthir, Draupadi, Kunti and the Kaurava royal family from Hastinapur entered the city, Mayasura observed that the Ganesha idol at the first platform of the temple had developed a crack in it. He immediately asked Arjuna for some time so that he could repair the idol, as it was mandatory to first worship Ganesha and then proceed to the main pujas, and a damaged idol could not be worshipped. However, Arjuna disagreed saying that there was no time for any repairs and insulted Mayasura for not doing the job properly. Mayasura started to argue with him, citing that the idol may have been broken while it was being transported. Further, Krishna spotted the Indra king present among the crowd who had thronged the streets waiting for the royal procession. The enraged Arjuna immediately ordered his guards to capture both the Indra King and Mayasura and send them out of Indraprastha. The guards followed their orders and immediately despatched both of them to the opposite bank of the Yamuna River. The worship rituals commenced and went on without the Ganesha-pujas and the entire inauguration event of Indraprastha carried on amidst great fanfare, while Mayasura and the Indra king watched dejectedly from the distance across the Yamuna River. At the end of the Kurukshetra war, the victorious Pandavas reigned from Hastinapur where King Yudhisthir ascended the throne. Arjuna held control over Indraprastha with Yuyutsa (the only Kaurava son of Dhritarashtra who had joined the Pandavas before the war) and the minor Vrishaketu (Karna’s 9th son and his only heir who had survived the war). Arjuna had promised the dying Karna that he would take care of his minor son Vrishaketu and would raise him to be a proficient warrior and give Indraprastha to him when he attained the age fit to be a ruler. The Pandavas ruled for a good thirty six years before they renounced the worldly life and retired to the heavens. During this period both Hastinapur and Indraprastha were under their reign and control. As the Pandavas departed, they placed Parikshit (Arjuna’s minor grandson) on the throne of Hastinapur and Vrishaketu (Karna’s son) on that of Indraprastha. The story of Indraprastha from thereafter to the modern times is blurred as there has been no recorded account of how the city went into decline. However, some Puranas and ancient texts validate the existence of Indraprastha, in that the Kauravas and Pandavas fought each other over five ‘prasthas’ (plains or places) later known in local as ‘pats’: Panipat, Sonepat, Baghpat, Tilpat and Indrapat. There is a strong belief that Indrapat refers to Indraprastha. Further, we have historial evidence of a village called ‘Indrapat’ located in the Purana Qila area (between Purana Qila and Humayun’s tomb) of Delhi, being in existence till 1913 post which it was demolished by the British. It is also believed that the Mughals constructed the Purana Qila (which was accentuated by Sher Shah Suri) on the mounds or ruins of mythical Indraprastha. The mythological references and description of its location, followed by the references in later ancient texts like the Puranas and the polished grey ware pottery findings in the excavations conducted in the Purana Qila area of Delhi, all point towards the conclusion that the magnificent and mythological Indraprastha may well be called the ancestor of present day Delhi. Based on more recent research done by the Archaeological Society of India, fresh set of excavations have commenced since 2014 in the area of the Purana Qila in quest of the lost Indraprastha of the Mahabharata. But if Vishwakarma’s blessings are to be believed, “this great city will live on forever”… it still does today in the form of Delhi! I am participating in the #BlogchatterA2Z challenge and today’s letter is ‘I’. Well it is indeed news to me that Indraprastha was built by the burning down of a forest like Khandav van by Agni. These minute details grounded in mythology remind me of the tales my father told me by my bedside to put me to sleep. You spend a lot of time in research and your articles are indeed very detailed. Thank you Jai for your comment, and I am happy that my posts are nudging you in nostalgia a bit! Yes, while Indraprastha was indeed built by burning down the Khandav forest, mythology does not demean the act by labeling it a destruction of ecology, but on the contrary justifies Arjuna and Agni's actions by stating that Khandav-van was a thorny forest and the home of all evildoers and followers of 'adharma' and that it was a just act to purge out all evil from the world as per the true dharma of a kshatriya. Storytelling, my life beyond dot com !